We should all know by now that Gaia is destined to study the motions and locations of 1 billion stars, but did you know that in order to achieve this goal, the precise location of the spacecraft itself is needed to an extremely high precision? In addition to the expert tracking methods utilised by ESA’s mission operations team at ESOC, ground- based observatories also provide important data. Enter GBOT, the Ground Based Orbit Tracking campaign that utilises a network of small-to-medium telescopes aiming at doing just that. In fact, GBOT is committed to deliver one set of data per day, which allows the determination of Gaia’s position good to 20 milli arcseconds. GBOT’s data on Gaia will be included in the orbit reconstruction performed at ESOC in order to increase the accuracy of this undertaking to a level of 150 m in position and 2.5 mm/s in motion. These tight constraints are needed, to ensure that Gaia’s measurements of the stars and Solar System objects are as accurate as possible. We – astronomers within the DPAC community – first set up the GBOT project in early 2008 and trialled it on missions already in the same orbital location that Gaia will operate from – L2 – including NASA’s WMAP and ESA’s Planck satellites. This allowed us to test our methods, and also get some clues about the probable magnitude Gaia that will have once in orbit. We assume that it will be around magnitude 18, but that it is still a big unknown. Since then we have developed a whole infrastructure, developing observing techniques, a dedicated software pipeline, a database, and have recruited observatories to deliver us data. The backbone of the data will be supplied by the 2 m Liverpool telescope located on La Palma, Canary Island, Spain, and the Las Cumbres Optical Global Telescope Network (LCOGT.net), which operates 1 m telescopes in Chile, South Africa, Australia and Texas. We will also have some support from ESO’s VST (the 2.6 m telescope at Paranal, Chile) and additional facilities will also provide data when needed. 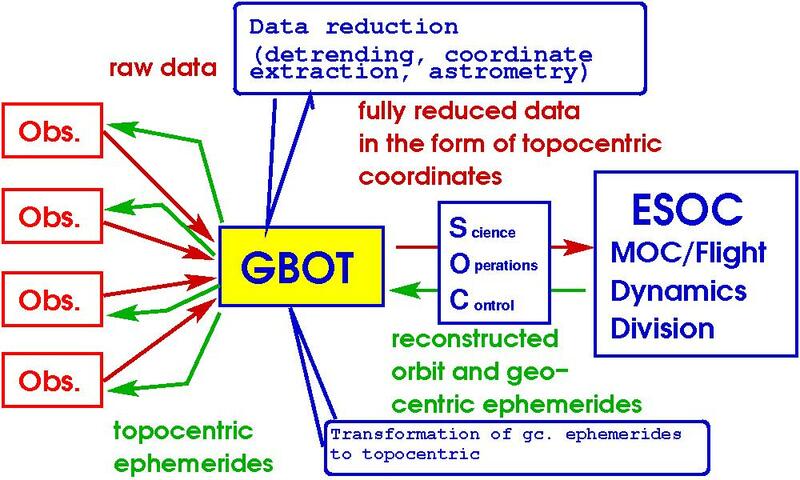 In 2012, we started a new fork of GBOT, radio-GBOT, which involves VLBI observations of Gaia. These are much more precise than the optical observations, but because they use more resources, we will use this technique less often and therefore the radio data will be used only to complement the optical measurements. The coordination of GBOT activities is done from Heidelberg. The data reduction, analysis and storage, will be done at the Observatoire de Paris (with a mirror of the database in Heidelberg). The pipeline software, which has been developed by the GBOT group in Paris imports and harmonises the data obtained from the partner observatories, processes the data and finally outputs the position of Gaia. The data is then delivered to ESA’s mission operation centre in Darmstadt via the science operations centre in Madrid. 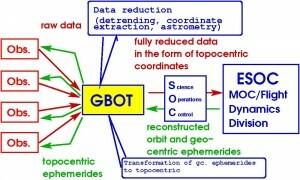 Likewise, the reconstructed orbit files from ESOC are retrieved by GBOT, converted into data on Gaia’s position, with finder charts, and then supplied to the partner observatories. Now, shortly before the launch of Gaia, GBOT is ready for action. GBOT’s observations commence about 10 days after launch; any earlier and Gaia is too bright for the instruments of the partner institutes. 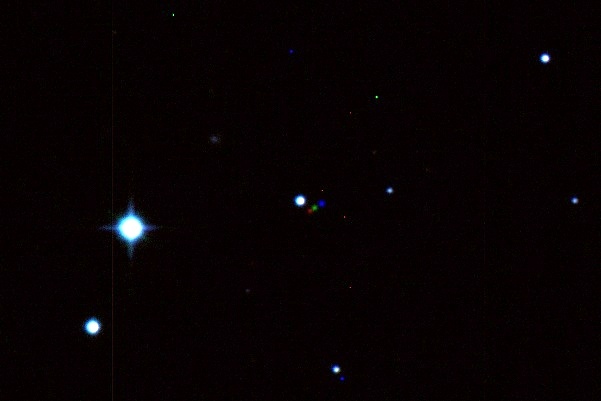 We hope to obtain motion clips of the spacecraft moving in front of star fields as the satellites journeys towards L2. It will be a challenging task for our small team, but we will do our very best to deliver! We are looking forward to the next – operational – phase of our project and the new challenges that await. Good luck Gaia and GBOT! Zentrum fuer Astronomie at the University of Heidelberg, Germany. Thank you for sharing, Martin! Even though GAIA itself will be too dim for small ground telescopes, occultations recorded by the global network of occultation observers might provide a useful supplement to the professional optical and radio methods. Fittingly, occultation observers saw a great improvement in shadow path predictions thanks to Hipparcos data, and look forward to a similar leap when GAIA astrometry becomes available. Wouldn’t it be appropriate if the amateur network could be invited to help? A typical amateur equipment setup used GPS-synchronized time and location and can resolve occultation event times to 17 ms of stars to V~11 or more. All that is required is a star identification and a shadow prediction (with approximate event time). This is indeed a very interesting idea, of which we at GBOT hadn’t thought of before. First it could deliver additional data, which can actually be used in the orbit reconstruction process, if the precision is right. Second, it can boost the awareness of and for Gaia in the public, or at least within the amateur community. That said, there are some issues that we do have. At this initial time round about launch it will be difficult to set up something like this from our side, later when things have quieted down a bit, that may be another matter. Therefore we would need volunteers to set this network up (I guess there are such people in the scene). We also have some constraints on the precision of the observers location – this is important since Gaia is much closer to Earth, than the asteroids, usually observed with the occultation method. While I am absolutely supportive of the idea of amateur contribution (after all I started my life as an astronomer as a backyard observer) I cannot at this stage make any promises. I would like to suggest the following route of action. We need to find some way of getting into personal email-contact (without exposing our email addresses to the whole of cyberspace), maybe the administrator of this blog can help. Then we can exchange more information and discuss a possible course of action. GAIA’s diameter of 10 m means about 1.4 mas apparent diameter from Earth, comparable or larger than main sequence star disk diameters beyond 8-10 pc. With an orbit determination at the level of 20 mas, a network of about 5-10 observers for each event would provide one positive occultation result.